Share the post "A Cabin with a Woodfire: The Perfect Winter Warmer"
One of the first questions prospective guests ask us when enquiring about accommodation is “does the cabin have a fire?” We are delighted to be able to assure them that there is and what’s more it will be ready for you when you arrive! All our cabins feature a log fire for you to enjoy during the cooler months. We know that not everyone has experience of internal woodfires so we pre-set all of our fires prior to your arrival, so on the first night you join us all you have to do is put a match to it, then sit back & relax. For subsequent nights you will then need to set the fire yourself and we have some tried and tested hints for building a successful fire. Ensure flu or air vent (on the door) is fully opened. Place one piece of wood on each side of the firebox laying front to back, pushing the already present coals and ash to the centre. Place 2 sheets of scrunched paper and kindling in between the wood. Place another piece of wood over the top of the kindling. Place a firelighter under the kindling towards the front of the firebox and light. Leave the air vent open until the fire is properly established then close the vent to the desired level. Once the fire is burning the air vents may be fully closed for slow combustion. This is the preferred option, especially at night, to hopefully allow the fire to burn through until the morning. We know that people join us to enjoy a romantic weekend away, and the log fire is a big part of that enjoyment, but please be aware that in the interest of the environment our wood supply is not an inexhaustible source (and we do have to purchase it). 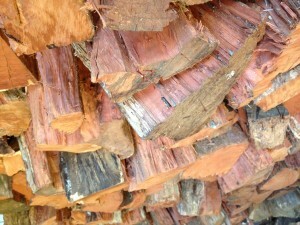 We fill your wood box (located at your front door) with sufficient kindling and wood for your stay. You should not need more than 5-6 pieces of wood for a cosy evening. The fire does not need to be blazing to be warming; in fact you may not realise how warm the cabin is until you are too hot! If you have to open doors or windows or use the air-con to cool off you are burning too much wood! In the morning, or after being away, if only a few coals remain, the fire can be easily restored by adding a piece of wood and opening the air vent. DO NOT stack the firebox full of wood as this will choke the fire and it will be difficult to restart. PLEASE use common sense at all times when using the fire. Don’t leave the door open for example and make sure nothing is sitting on top of the fireplace. DO NOT take hot wood, coals or ashes out of the fire box. DO NOT use the fire door to push wood into the firebox as the glass may break. PLEASE ensure the fire door is closed at all times otherwise the smoke alarm will sound. DO NOT empty the ash from the firebox, even if it is cold. The fires need a bit of ash in the base to burn efficiently. We will empty them as required. 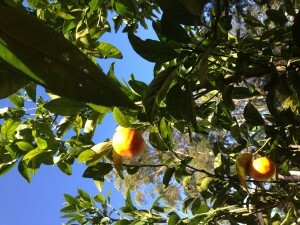 We use the ash to fertilise our yummy citrus trees!